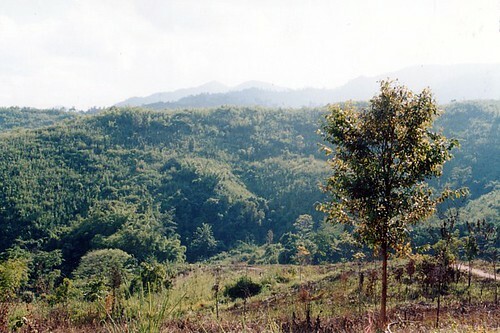 Nan is located in North-Eastern Thailand, named after the Nan river. It’s a very nice, quite location, a valley surrounded by mountains. Nan is a nice place to visit if you want to go somewhere with not a lot of tourists. The people here have been doing traditional handicrafts for a very long time. If you are interested in religious arts, the murals are a must-see. They are in two Buddhist temples: Wat Phumin temple and Wat Nong Bua temple. 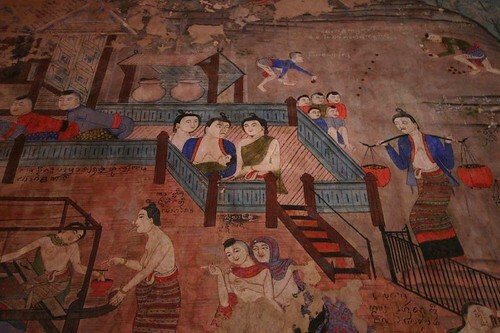 The murals depict scenes from previous lives of the Buddha, legends of Nan and the surrounding areas, heaven and hell. Even if you are not so interested in temples, Wat Phumin is still amazing. Some of the structures of this temple are five hundred years old, and quite unique. Not at all the typical kind of Thai temple. In late October or early November, there are Lanna boat races here, and during that time this little town gets livelier. In this area, you can get good cotton, and they also make a paper from mulberry trees. They also have a museum here. It is called the National Museum. Once it was a teak-wood palace for local rulers, and now it is accessible for the public. This is the best place to learn about the history of Nan and its people. Explore the area with a personal Thai tour guide who can help you with local knowledge and translation, as many people here don’t speak English. Next post: How to avoid jetlag when coming to Thailand? Like to Travel? Have a Smartphone? Take a look at this!